Because Christ ascended to heaven, the relics of Christ are either objects that were touched, such as the objects of the passion and clothing, or body secretions, such as blood. With Christ, a piece of the cross on which he died became the most widespread and precious relic. Beautiful crosses and reliquaries were crafted to house a portion of the True Cross, called a staurotheca, such as the Cross of Justin II or Crux Vaticana (the oldest cross with a relic of the True cross), the Cross of Cong in the National Museum in Dublin, Beresford Hope Cross, and the Stavelot Triptych in Pierpont Morgan Library in New York. Concerns over the use of relics as idolatry has occurred throughout history. In the fourth century, for instance, Jerome discouraged the use of these relics of the cross for any special power other than as a reminder of the crucifixion of Christ. (12) However, like the miracle involved in its identification, pieces of the True cross were generally believed to possess special powers and also produced cures and miracles. One of the earliest reports is by St. Paulinus, who writes that when his house caught on fire, he used a piece of the cross to put out the flames. (13) Other examples are the use of the relic of the true cross in assuring victory over earthly enemies. Constantinople in 600 placed the relic along with an "unpainted image"image of Christ and the mantle of Mary on the walls "as if they were defensive weapons to ward off attackers. "(14) Besides being just a defensive weapon, since the time of Constantine, the cross had been associated with military victory. 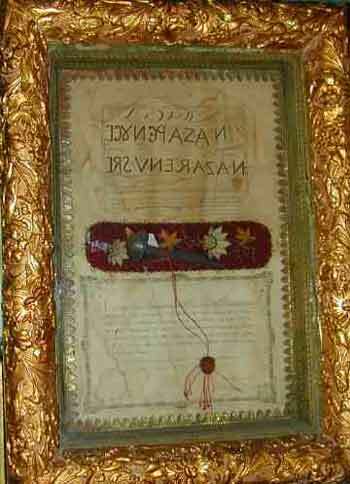 This relic of the True Cross is enclosed in a large hollow nail and prominently displayed at Mission San Jose, near Fremont, California. Note the facsimile of the title with the script going left to right instead of right to left. O Lord, save Thy people and bless Thine inheritance. Grant victories to the Orthodox Christians over their adversaries; and by the virtue of Thy Cross, preserve Thy habitation. Kontakion (long hymn) As Thou was mercifully crucified for our sake, grant mercy to those who are called by Thy name; make all Orthodox Christians glad by Thy power, granting them victories over their adversaries, by bestowing on them the invincible trophy, Thy weapon of peace. We venerate your cross, O Lord, and we Glorify your Holy Resurrection. From "Elevation of the Cross" Orthodox Church of America website. This feast is described as the national holiday of the church in the east, similar to the Fourth of July in America.